Lightly roasted in peanut oil and sprinkled with a dash of salt, our Whole Jumbo Cashews are rich in flavor and plump in size! Cashew nuts are actually seeds that adhere to the bottom of the cashew apple, the fruit of the cashew tree, which is native to the coastal areas of northeastern Brazil. The trees are now found all over the world thanks to propogation by Portuguese explorers. The seeds actually grow out of the bottom of the fruit, called maranon in Spanish. The apple portion of the fruit is made into jams and feni liqueur, and while unknown in America is a delicacy in other parts of the world like Africa, India and Vietnam. The seed we know as the kidney-shaped cashew "nut" is delicate in flavor and firm, but slightly spongy, in texture. You have probably noticed that cashews in the shell are not available in stores. 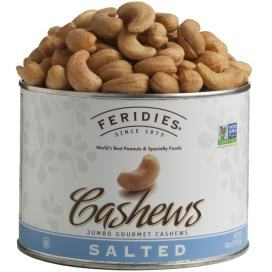 This is because these nuts are always sold pre-shelled since the interior of their shells contains a caustic resin, known as cashew balm, which must be carefully removed before they are fit for consumption. And once the shells are gone, and those firm yet crunchy, sweet and buttery kernels we know as cashew nuts are fit for consumption, they pack quite a nutritional punch! Cashews are an excellent source of minerals like copper, iron, phosphorus, magnesium, selenium, manganese and zinc. They're also rich in B-vitamins, and high in calories—about 550 calories for a 100 gram serving, and loaded with dietary fiber and healthy phytochemicals that protect from cancer and other diseases. They're heart friendly too, with plenty of monounsaturated fatty acids like palmitoleic and oleic acids that help keep harmful LDL cholesterol low and boost good HDL cholesterol. Cashews can even help your eyes because they have a small amount of zeaxanthin, an important antioxidant for retina health. Try our roasted, salted cashews. 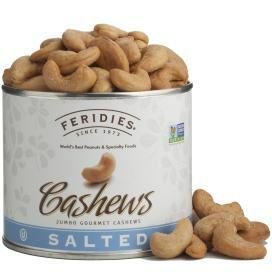 FERIDIES® offers whole jumbo roasted cashews that are lightly roasted in peanut oil and sprinkled with a dash of salt. They are OU Kosher Certified and Non-GMO Project Verified.